If you fancy any of these photos enough to repost elsewhere on your favorite Airsoft forum or Facebook page, please feel free to do so. If you wouldn't mind simply including a hyperlink back to this post on the Pyramyd Airsoft Blog, I would think very nice things about you. Photo credit: KWA Performance Industries, Inc. 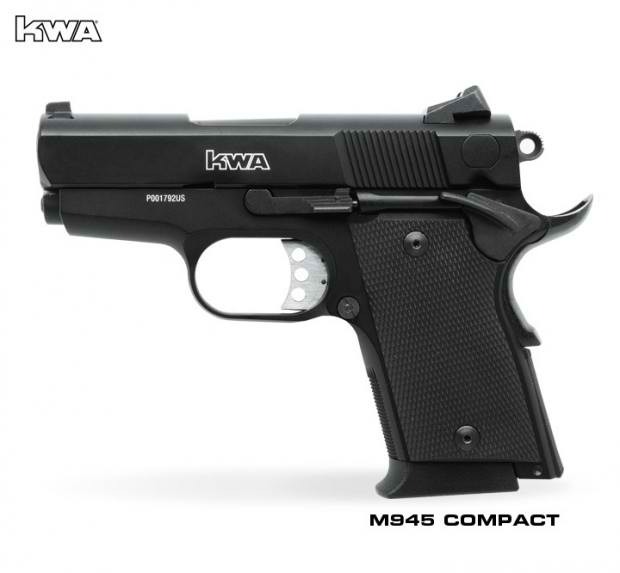 The M945 Compact is the first of KWA's tiny guns to utilize their highly-touted NS2 gas system. The KWA M945 Compact GBB pistol might look small...but that's because it is small. Ha. See what I did there? I normally steer clear of subcompact pistol frames because usually my hand hangs off the bottom of the grip, leaving my pinky finger somewhat dangling in the wind, which I don't particularly care for. Despite its subcompact frame, however, the KWA's M945 actually fit my big gorilla hands without issue. I don't have any more details than what you can see for yourself in the pictures as far as the features for KWA's M945 Compact GBB pistol. While unconfirmed at present, I'd expect the M945's release date to be sometime during 4th quarter, based on conversations I've had with KWA about their other guns. Right now, it's pretty clear their focus is on getting the MK23 USSOCOM NS2 GBB Pistol and Adaptive Training Pistol (ATP) off the ground. Both the MK23 and the ATP from KWA will be available to order from Pyramyd Air very soon (Their shipment should be on its way by now). On another note, here are teasers 2 and 3 from our friends over at the Airsoft Squared Social Network, which is about to be unveiled to the general public in just a few days. Well, that wraps it up for now. Don't forget to contact your favorite California Assembly Member to let them know that you are greatly opposed to Senator Kevin de Leon's SB 798 legislation that he's trying to use to destroy our Airsoft livelihood. Make sure to set a good example of responsible Airsoft gun safety and ownership by not showing off your guns in public and wearing eye protection whenever you handle them.